From comfy sofa to an elegant day bed in an instant. Drop-arm sofas offer sumptuous padding, versatile removable cushions and are available in a wide choice of quality fabrics in classic shades and modern colours. 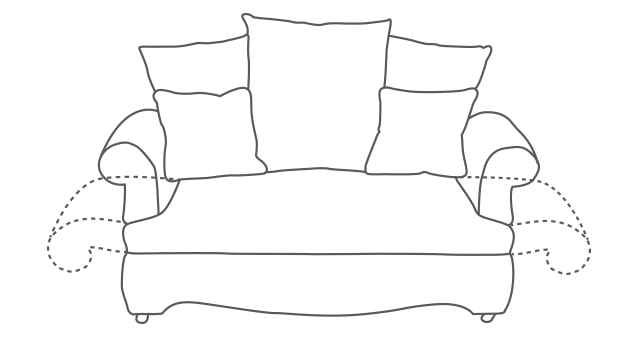 What is a drop-arm sofa? 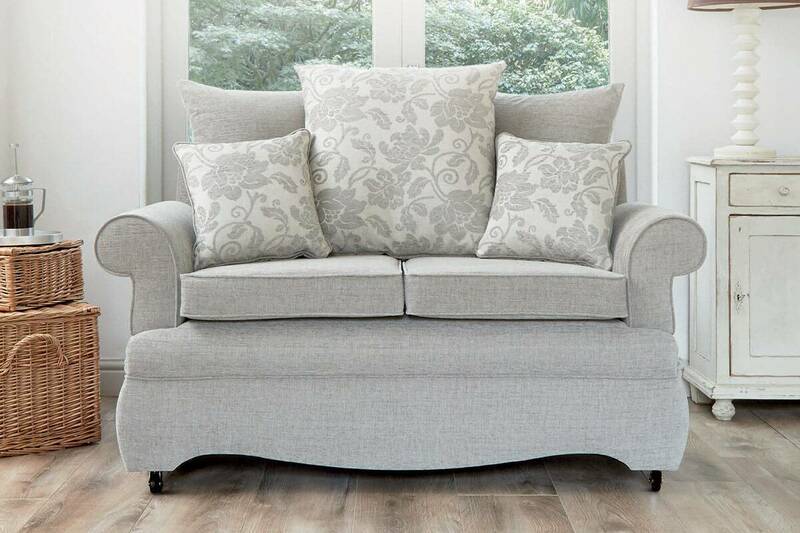 Versatile and practical, drop-arm sofas use only the best quality fabric and materials to give you all the support and comfort you would expect from an HSL sofa. Should you ever fancy putting your feet up for an afternoon snooze, then our drop-arm sofa range will be of interest to you. Both the arms simply drop down, allowing you to stretch out fully and comfortably without having to leave the warmth of your living room. The compact design of drop-arm sofas are ideal for homes where space is at a premium as when the arms are fully dropped, they create a comfortable single bed. In the morning, you can simply place the armrests back in their upright position to quickly return the bed to a sofa. Having more control over your sitting position can be a welcome benefit to those who struggle with common ailments such as arthritis, backache or swollen joints. It is just as important to think of seat height and lumbar support when you are buying a sofa as when you are buying a chair and our sofas are designed to match many of our chair designs. Drop-down arms mean you can use them as a sofa, chaise longue or occasional bed. Easy-to-use design that doesn’t require much physical effort. Looks like a regular sofa, so fits in with surrounding décor. A wide range of fabrics and cushions available to suit many interior styles. Available with Guardsman Stain Protection. 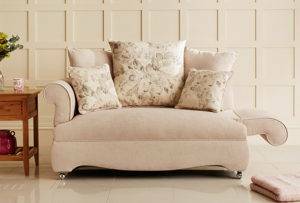 Matching accessories such as cushions, footstools and slipper boxes available. When you are looking for a new drop arm sofa, you should make sure that you’re getting the perfect one for you to ensure comfort long after delivery. If you’d like to speak to a trained Comfort Expert about our drop-arm sofas, simply pop-in to your nearest HSL and we’ll be happy to assist you. Alternatively, you can also book a free visit from our Home Consultation Service. It’s a known fact that poor posture can affect people of all ages, shapes and sizes, but the aches, pains and lifestyle problems it causes can really begin to show in later life. It’s never too late to improve your posture, the smallest of changes can help you feel more comfortable, even the right chair, sofa or bed can leave you feeling rejuvenated. At HSL we’ve devoted over 50 years to finding clever ways to help make people more comfortable. Because we passionately believe in the importance of posture and wellbeing, our chairs, sofas and beds are built with CleverComfort™, combining ergonomics and experience to create furniture that is designed to fit you, providing maximum postural support. When considering an HSL chair or sofa, our Comfort Experts will conduct a personalised 7- point seating assessment™ to determine which size fits you best and the right level of support for your neck, back and hips, to improve your comfort and well-being. We all want our furnishings to look right in our homes, and thankfully HSL has hundreds of beautiful fabrics to choose from. Whether you’re a fan of a modern look, or love the more traditional style of patterned fabrics, you can customise and build your own drop-arm sofa to suit your tastes. 2018 is our Golden Jubilee year, and we’re immensely proud of the fact that, to this very day we remain a trusted, family-run business. All our chairs, sofas and beds (excluding Stressless®) are handcrafted here in the UK by our team of skilled craftspeople. We also have a huge selection of fabrics and leathers to choose from as well as the option to order any of our fabrics by the metre (just in case you’d like to make some matching curtains). As well as offering you excellent style and quality, our Comfort Specialist are all extensively trained to ensure they have recommended the right chair or sofa for you. If you’d like to speak to a trained Comfort Specialist about our drop-arm sofas, simply pop into your nearest HSL store and we’ll be happy to assist you. Alternatively, you can book a free, no obligation visit from our Home Consultation Service.